Katherine Paterson is the current National Ambassador for Young People’s Literature. Her international fame rests not only on her widely acclaimed novels but also on her efforts to promote literacy in the United States and abroad. She is a two-time winner of the Newbery Medal and the National Book Award, and she has received many other accolades for her works, including the Hans Christian Andersen Medal, the Astrid Lindgren Memorial Award, and the Governor’s Award for Excellence in the Arts, given by her home state of Vermont. 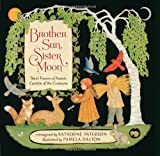 Katherine Paterson was also named a Living Legend by the Library of Congress in 2000. She lives in Barre, Vermont, with her husband, John Paterson. John Paterson Sr. has collaborated with his wife, Katherine, on Consider the Lilies: Plants of the Bible; Images of God; and Blueberries for the Queen. He lives with his wife in Barre, Vermont. John Rocco collaborated with Whoopie Goldberg on the picture book Alice, was Creative Director at Walt Disney Imagineering, and served as preproduction art director at Dreamworks for the film Shrek. His children’s books include Fu Finds the Way, Wolf! Wolf! and Moonpowder, and his illustrations are also featured on the jackets of Rick Riordan’s bestselling YA series Percy Jackson and the Olympians. John Rocco lives in Brooklyn, New York.